Gobs of smoke, over-the-top construction, a nice burn time and a sweet fermented tobacco flavor mix, what more can you ask for in a cigar? Well that's just what I found smoking this La Aurora Cigars Puro Vintage 2006 Edicion III Aniversario Salomon. This La Aurora Puro Vintage 2006 Edicion III Aniversario Salomon is a pretty special cigar. All the tobacco leaves in the blend were harvested in 2006 and production was limited to 1500 numbered 1906 replica boxes. Looking at the overall construction, it's very nice. The Colorado Maduro colored wrapper is rolled on seamlessly and there are only the finest of veins present. The cigar is packed well full length and the combination of an Ecuadorian wrapper, Brazilian binder over Dominican, Nicaraguan, and Brazilian fillers produce a pleasant aroma of spicy fermented tobacco from the cold foot. After clipping the end, the free cold draw again has notes of well fermented spicy tobacco, but there are added hints of sweet tree fruit. Once the cigar was burning the first medium body mouthfuls of smoke, and I mean mouthfuls, had notes of toast and lightly spicy fermented tobacco, plus the smoke left behind a nice spicy aftertaste. As the razor sharp burn progressed, the strength moved into the full range with added nuances of brown sugar, tree fruit, oak, earth, wheat straw and more toast. The cigar finished it's sixty-five minute burn with a flavor mix of oak, caramelized brown sugar, earth and a hint of charcoal. It was a pretty tasty finish. 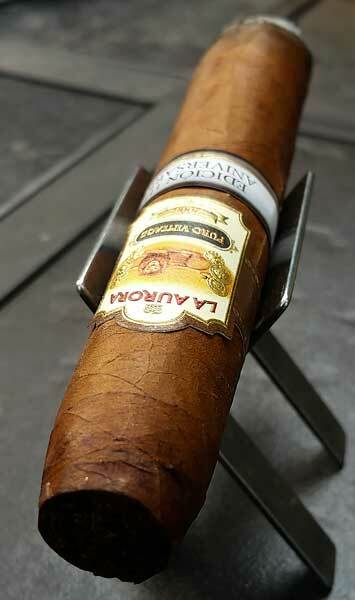 Overall this La Aurora Puro Vintage 2006 Edicion III Aniversario Salomon was a great smoking experience. This sample was provided for review by Miami Cigar & Company and the Creativas Group.